Different trim levels of the same car will often have a myriad of non-interchangeable parts, and even though it may seem straightforward to tell, simply knowing if your car is a ‘Sport’ or ‘Turbo’ model isn’t usually enough to know for sure. This is because car manufacturers sometimes allow parts of other trim levels as check-box options when ordering. The most common offenders are brake and suspension packages, and sometimes it can be a real trick to find out what came stock on your car. SAAB thought it would be kind to owners by stamping all this information right on the car. Check out this page for plate locations: http://www.saabworkshop.com/index.php?page=workshop&article_id=8. Here are some examples for a couple common SAABs. The OG9-3 (99-03) had a few suspension options from the factory, and while you may find out what package you have by looking at the color code on the springs, this is not an easy option for many. There’s a quick and easy solution, just take a look at the 9-3’s VIN plate! Find the image below in your door jam and we can get started (and hope that no previous owners made changes). 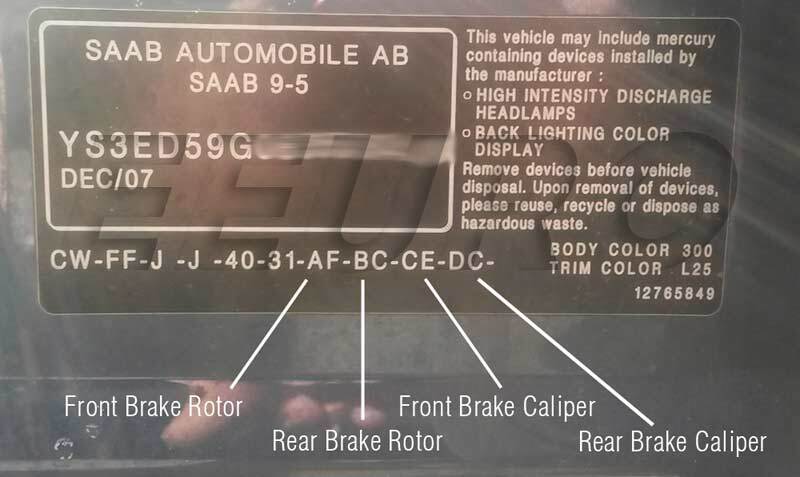 This style of VIN plate may apply to all SAABs manufactured around this time, such as the 9-5. 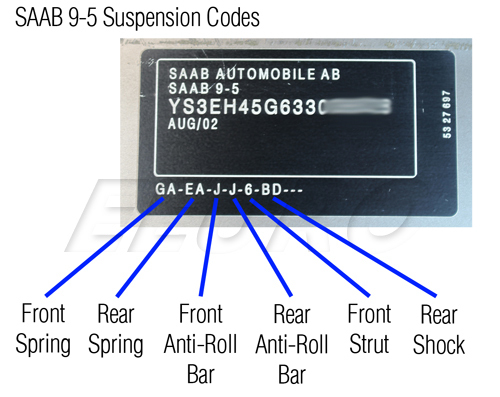 Later model SAABs have this information all saved within the VIN number, including brake sizes. After 2006, this plate should also show Brake Codes. This plate is off of an 06+ SAAB 9-5 Wagon (a 2008 to be exact). You can notice the thoughtful addition of brake codes, as compared with the earlier style plate. When ordering any of these components, your safest bet is to call our customer service reps with your codes/VIN ready! We use the same software used by dealers, mixed with years of knowledge to get you the right part the first time. BMW made the process easy by saving nearly every possible detail and option associated with the vehicle’s VIN. Check out this website: http://www.bmwarchiv.de/vin/bmw-vin-decoder.html, just put in the last 7 digits of your VIN and suddenly access details like radio type, suspension packages, cargo accessories, interior package color, exterior package color….etc. Unfortunately for Volvo owners, most of this information cannot be found through VIN plates. Every car manufacturer is different, so putting together a complete encyclopedia of VIN codes would be near impossible. However, this post will hopefully get you on track to looking out for and finding the codes stamped on your car when it left the factory. So go forth everyone and have a good look at your number plates, they can tell you more than you thought! This was very helpful, but on my 2003 9-5 Arc, this plate is located under the hood on the top of the left front fender, not the door jamb. There is another VIN plate on the door jamb, but it only has paint codes and tire pressures.